Active learning comprises a wide range of activities that are defined as “any instructional method that engages students in the learning process. In short, active learning requires students to do meaningful learning activities and think about what they are doing” (Prince, 2004). In the 1980s, Arthur W. Chickering and Zelda F. Gamson (1987), asserted that effective teaching encourages active learning. “Learning is not a spectator sport,” they emphasized, as “students do not learn much just sitting in classes and listening to teachers, memorizing pre-packaged assignments, and spitting out answers.” In order to have significant learning experiences, “they must talk about what they are learning, write about it, relate it to past experiences, and apply it to their daily lives. They must make what they learn part of themselves.” Do active learning activities make learning significant and simultaneously get students interested, engaged and motivated? Increases students’ satisfaction and positive attitude towards course material as well as their self-confidence and self-reliance (Springer et al., 1998). • Motivates students to be engaged learners (Huston, 2009). Increases content knowledge, critical thinking and recall of course content (Cherney, 2008). • Allows for inclusion of different learning styles (Thaman et al., 2013). Increases enthusiasm for learning in both students and instructor (Diochon and Cameron, 2001). Gets students involved in higher order thinking, such as analysis, synthesis, creative thinking, adaptability, problem-solving, etc. (Gosser et al., 2005). Who can use Active Learning at the University of Toronto? What are the different types of Active Learning and How can I use them in my classroom? THIS MANUAL EXPLAINS 18 SPECIFIC ACTIVE LEARNING ACTIVITIES ON HOW TO GET STUDENTS INTERESTED, ENGAGED AND MOTIVATED. reflecting on the learning process. and outside the class (in e.g., study groups, online discussion boards, etc.). Active learning activities can be tailored to specific time constraints. The activities can be as short or as long as time permits, ranging from between 1-2 minutes to 20-40 minutes. How do I form Ad Hoc Groups during a classroom session? Ask students to form groups with the two or three or four people around them. For classrooms with fixed furniture, have students turn to the people behind (or in front) of them. Ask students to form groups with the two or three or four people who they don’t know who are around them. Have students introduce themselves first before working on the topic. For classrooms with fixed furniture, this may mean changing seats. How can I scale up Active Learning Activities for large groups of students? Tutorials and classes at the University of Toronto come in all shapes and sizes. And so you need to be prepared to adapt your lesson planning, your learning activities and even your overall teaching approach to different types of tutorials/classes. In this manual, you will also learn how to adapt different active learning techniques to accommodate the different teaching contexts that you may encounter. Effective active learning techniques are not dependent on the type of classroom they occur in or on the number of students in the class; they are instead shaped by the facilitator, together with the students. Remember, experiment with these different active learning activities and you will quickly realize how much you and your students will engage in significant learning! Purpose: This activity is designed to help students access prior knowledge. It promotes connection between students and allows the teacher to also get some feedback about prior learning. Have students fold a piece of paper lengthwise to form two columns and write “Give One” at the top of the left-hand column and “Get One” at the top of the right-hand column. Ask students to brainstorm a list of all the things they already know about the topic they will be studying by writing the items down in the left-hand column. You may want to give them a specific number of bullets to guide the amount of responses. After making the list, have students stand and find a partner. Each person should “give one” of their ideas by saying it out loud. Partners take turns sharing. Have students write any new information they get from these discussions in the “get one” column of their lists, along with the name of the person who gave them the information. Students should rotate around the room, talking to two or three partners. Once everyone has given and received information, the whole class can discuss the information students have listed. Adapting ‘GIVE ONE- GET ONE’: This activity can be easily scaled up by inviting students to connect with the people in the vicinity of where they are sitting. It will be important to be clear to students how many people they should connect with and the procedure that they should use to determine who to connect with. Purpose: This activity is also called an exit ticket and it provides an opportunity for the students to give low risk/stakes written feedback to the teacher. It allows the teacher to also get some feedback about student learning and even measure the effectiveness of different learning strategies being used in class. At some point during the class, identify a question that you would like to have students answer and let them know that answering this question will be their ticket out the door. You can even provide them with a small piece of paper that has the question written on it. Remind students before the end of class and then give students a few minutes at the end of class to write their response. Make arrangements to collect the tickets. You might have students place them in a box at the door or, you may want to stand at the door and collect them yourself. As with any learning activity and assignment, teacher feedback is important. It is the essential element to making the activity successful. You must do something with the work in order for the student to know that his effort has been noticed and honored. This could include sending a summary to students by email or responding to their responses at the beginning of the next class. 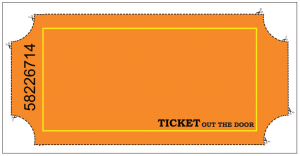 Adapting ‘TICKET OUT THE DOOR’: This activity can be adapted for large scale classrooms with the use of small groups. Follow up by the instructor can happen in the next class or online through a generation of a composite document of questions. Purpose: This cooperative technique provides an opportunity for learners to deepen their understanding by exploring issues and expressing opinions. The technique can energize a lesson by providing movement and interaction with peers. Post the dimensions related to the topic in each of the four corners of the room (e.g., strongly agree, agree, disagree, strongly disagree or number four different pictures and then post the numbers). Each student selects a particular dimension in response to a question posed by the teacher, and moves to the appropriate corner. Once in their selected corner students pair up to discuss the reason(s) for their choice. Students listen actively to their partner’s response and are prepared to share what they heard their partner say. The teacher randomly chooses partners to share responses from each corner. Adapting ‘FOUR CORNERS’: This is an activity that can be adapted to a large scale classroom with a few structural changes. Rather than posting a question or number in four corners, post a diagram of the room on the screen (on a PowerPoint slide), clearly marking where students should move to identify with a particular dimension or image. The rest of the lesson could proceed as with a smaller classroom. You can also put a stopwatch on the projector so students have access to the same timing that you are using http://www.online-stopwatch.com/countdown-timer/. Purpose: 3 – 2 – 1 is a graphic organizer that learners use to record ideas, observations and/or reflections related to a specific learning experience. Learners reflect on the questions posed and record their ideas on the 3 • 2 • 1 graphic organizer (e.g., after viewing a video, listening to a panel presentation or guest speaker, engaging in a service-learning activity, reflecting on a personal experience, etc.). Learners then share their ideas with others (e.g., Think Pair ShareTechnique #5 on this handout). The instructor listens for patterns in the students’ responses and uses these to debrief or link to the next part of the instruction. Adapting ‘3-2-1’: This is an activity that would work well with a larger scale classroom because it involves individual reflection. Students can respond individually in their seats. Students can either share some of their responses in class and/or you can collect their papers as a Ticket out the Door (Technique #2 on this handout), compile their responses and then provide a response to students either online or in the next class. Adapting ‘THINK-PAIR-SHARE’: This is an activity that would work well with a larger scale classroom because it involves individual reflection and simply turning around and sharing with one other person. When it comes time for sharing with the larger group, students can either be invited to share some of their responses in class and/or you can collect their papers as a Ticket Out the Door (Technique #2 on this handout), compile their responses and then provide a response to students either online or in the next class. Purpose: Students work in pair to improve their note-taking, writing and organization skills. Often times there are gaps in students’ notes and with this collaborative learning technique, students are given time to check, compare and correct their notes with a partner. Procedure: After notes from a lecture have been taken. 1. Choose to do during breaks in the lecture or at the end of the lecture. Students are given time to pair with their neighbour to compare and review notes. Have partner A summarize one section with their partner highlighting the main points and identify ambiguous concepts and questions that they have. Partner B clarifies/shares their thoughts based on their notes, filling in the gaps. Remaining questions should be brought and discussed through a Fish Bowl (Technique #8 this handout) or posed to the class. Partner A and B switch jobs for the next section. Repeat until all of the notes have been revised. Be sure to take time to respond to remaining questions. Adapting ‘NOTE-TAKING PAIRS’: This activity would work really well in a larger scale classroom. In order to reduce the amount of time that it would take to answer the remaining questions (see question 3 above), you could have students submit their remaining questions to you as their Ticket Out the Door (Technique #2 on this handout) and you can respond to remaining questions either online or at the beginning of the next class. Purpose: This activity provides students with an opportunity to engage with a text and then respond to it in a low risk situation. It can be used as a tool to build further activities on. This is also a great activity on those days where no-one seems to have done the readings you planned your lesson around! Procedure: Typically students read a text up to a set point (e.g., the first page, the end of a section). Then they pause and “say something” about what they’ve read to their partner. They may, for example: summarize the section; identify a key point; make a connection to their own work; share their thinking about a new idea or raise a question about a concept or strategy presented. At this point you can combine pairs to have students engage in group discussion, have them repeat the process to the next stopping point, or bring the conversation back to the class as a whole. Read the text provided up to the point marked A. When both you and your partner have read the section, pause and “say something”. You may: summarize the section; make a connection to your own teaching or learning experience; or raise a question or concern about a concept or strategy presented. Now repeat the process: continue reading to the point marked B, then stop and “say something”. Repeat again with the final section (time permitting). Combine with another pair. Share the most interesting points that came up about the reading in your paired discussion with the rest of the group. Are there any common points that stand out? Continue your discussion in the larger group. Dividing students up into groups has the potential to take a long time. Give clear instructions about the division as you don’t want them to move too much and so making a suggestion that they turn and pair with someone sitting in front or beside is a quick way to do this. Once they have their pair, distribute the readings. When you are changing over to the small groups (i.e., 2 pairs), instruct students to turn to someone at their table or in the near vicinity. You can put a stopwatch on the projector so students have access to the same timing that you are using. If you do not have enough time for a larger group discussion about the issues, assign questions for students to answer in an online discussion board or through an assigned reflective journal due online before the next class. Once you have read student responses, you can summarize the main points in the next class. Purpose: To encourage students to offer feedback on course readings or class discussion. It is often more helpful and engaging to get students to provide the answers to their peers. Procedure: Students are given index cards, and asked to write down one question concerning the course material. They should be directed to ask a question of clarification regarding some aspect of the material which they do not fully understand; or, perhaps you may allow questions concerning the application of course material to practical contexts. At the end of the class period (or, at the beginning of the next class meeting if the question is assigned for homework), students deposit their questions in a fish bowl. The instructor then draws several questions out of the bowl and answers them for the class or asks the class to answer them. This technique may be combined with many other questioning techniques. Adapting ‘THE FISH BOWL’: This particular activity is well suited to large scale classrooms. It allows students some anonymity but also provides them with an opportunity to receive feedback from you, in answer to their different questions. Purpose: Students typically can generate more comprehensive lists working in groups than they can alone. This method is particularly effective when asking students to compare views or to list the pros and cons of a position. Have students make a list of opposing points or arguments on paper or on the blackboard. One technique that works well with such comparisons is to have students draw a “T” and label the leftand right-hand sides of the crossbar with the opposing positions (or “pro” and “con”). Students then list everything they can think of to support these positions on the relevant side of the vertical line. Once students have generated as thorough a list as they can, the instructor can ask them to analyze the lists by asking questions that are appropriate to the exercise. Adapting ‘VISUAL LISTS’: This activity would work well in a large scale classroom. Showing students an example of the structure they should create with examples on the screen or board would be helpful for clarity. Student board work would not work well in a large scale classroom but paper and markers would work well. You could have a large group discussion, asking each group to share one “pro” and one “con”. You can collect the papers at the end of the class to ensure that you have a good sense of the discussions that occurred. These pros and cons can be tabulated and you can follow up with discussion either online or in class the following week. Purpose: Structured Problem Solving provides students with a process for solving a complex, content-based problem within a specified time limit. All members must agree to a solution and must be able to explain both the answer and the strategy used to solve the problem. It helps students identify the logic approach behind the problem and identify where their logic fails by providing them with the steps to working out the solution to the problem. Preparation: Create a problem that is complex enough to require the students to use sophisticated problem solving skills. Use research and current questions as a resource. Identify the problem and the logical steps required to devise a solution. Solve the problem yourself using the procedure you’ve established in order to uncover problems and difficulties or error present. After problems are developed, organize students into groups or teams and assign each group a problem. Ask teams to report/present their problem, solution and the method (steps) they took in solving the problem. Dividing students up into groups has the potential to take a long time. Give clear instructions about the division as you don’t want them to move too much and so making a suggestion that they turn and make a group with 2-5 people sitting in front or beside is a quick way to do this. Purpose: Group Investigation is a cooperative structure that enables students to plan and carry out a course of study. This structure is complex but students are involved in multifaceted learning tasks that demand greater autonomy and group self-direction. There are 6 main stages: 1 – Grouping, 2 – Planning, 3 – Organizing, 4 – Investigation, 5 – Presenting, 6 – Evaluating. A. Present topic and use several key questions to define the scope of inquiry. Students may scan a variety of resources to activate their prior learning and stimulate inquiry. B. Clarify the topic: Develop a list of questions that the students would like to investigate. You may guide this or have the entire class brainstorm together. C. Classify questions to create sub-topics. D. Form investigation groups: Students select subtopics of interest and form cooperative groups. Ensure that the groups have a good mix of contributors. A. Clarify the task: Each group explores its subtopic and formulates a research problem. Focus questions are developed to outline the scope of inquiry. B. Develop an action plan: The group decides: 1. Aspects to investigate. 2. Deadlines for reporting back. 3. Resources needed. C. Assign or have students select jobs and responsibilities. A. Prepare a daily plan: Group members complete an action plan for each investigation day. B. Research sub-topic: Gather data from resources. C. Analyze and evaluate data: Assess the relevance of the data related to the question. D. Apply the data: Members share their data to solve the group problem. A. Select a reporting method: Determine the presentation format. It may be a presentation, poster, etc. B. Plan the report: Members discuss individual roles for the presentation and complete a presentation plan. C. Construct the report: Individual assignments are complete to form the report. B. Respond to the report: Other groups may seek clarification or give feedback. A. Establish the criteria: Establish the criteria in advance and use a rubric. B. Clarify the components: This may include: 1. Teacher and student evaluations. 2. Formative and summative evaluation. 3. Weighting of the process and the product. 4. Ratio of individual to group marks. C. Check for understanding: Be sure that the students understand at the beginning how they will be evaluated. Students may complete a selfevaluation and add it to their portfolios. Teachers may also require an individual report or testing of the material after the final presentation. Adapting ‘GROUP INVESTIGATION’: This activity is more complicated than many of the activities included in this resource guide. In order to run this activity effectively with a larger group of students, you would need to ensure that the different parts of the process for the students were clearly outlined. Putting up a slide with directions would not provide students with enough clarity. It would be more effective to give students a handout explaining the different steps, so they could follow along while you described the process and refer back to it while they were participating. In order to have an accurate picture of the individual role in the group, you may want to have students hand in process journals that contribute to their final mark. Purpose: Here the students are asked to become actively involved in the creation of tests and quizzes. The examples they come up with maybe assigned for extra value or used on a regular class schedule to provide feedback to the student regarding whether they understand the content or not. In asking students to think up exam questions, we encourage them to think more deeply about the course material and to explore major themes, comparison of views presented, applications, and other higher-order thinking skills. Beyond simply using example questions as a quiz or test, ask the students to evaluate the question submitted; in discussing questions, they will significantly increase their engagement of the material to supply answers. Students might be asked to discuss several aspects of two different questions on the same material including degree of difficulty, effectiveness in assessing their learning, proper scope of questions, and so forth. Adapting ‘QUIZ/ TEST QUESTIONS’: This activity can be adapted for large scale classrooms with the use of small groups. Small groups can work together to generate the questions. The small groups can share with the larger groups either by sharing in the larger group or by posting their questions to an online discussion board. Follow up by the instructor can happen in the next class or online through a generation of a composite document. Purpose: A jigsaw provides a way for students to learn new content and also provides an opportunity for them to teach each other what they have learned and discuss implications of the reading. 1. Instructor selects articles, excerpts from books or other text appropriate to course content. 2. Provide one reading per person, or longer articles can be divided into appropriate sections. 3. 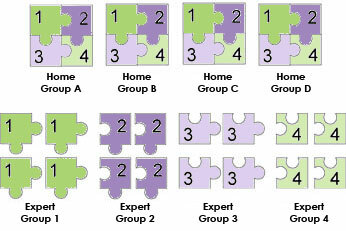 Divide the students into small Cooperative Jigsaw groups (e.g., 3-6 persons in each group). 4. Have each member of the Cooperative Jigsaw group silently read the text assigned. Each person will have a different reading. Time: 5-10 minutes. 5. Create new small (2-3) “Expert” groups with the individuals who have read the same material. Allow time for learners to discuss what they have read and how they might teach this when they return to their Cooperative groups. Time: 5-10 minutes. 6. 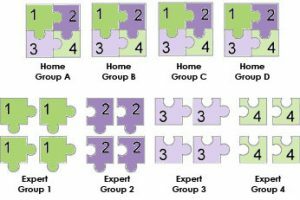 Recreate the original Cooperative Jigsaw groups. Have each person teach the rest of the group the material from the text read. Time: 5 minutes / person. 7. Conclude with a key question(s) for the groups or discuss applications or implications of the ideas within the groups or with the entire class. Maybe combined with other take-up evaluation techniques to ensure that individuals understand the content. 1. Dividing students up into groups has the potential to take a long time. Give clear instructions about the division- you don’t want them to move too much and so making a suggestion that they turn and make a group with 2-5 people sitting in front or beside is a quick way to do this. Once they have their groups, instruct one representative to come to the front for the readings. 2. When you are changing over to the expert groups, instruct students to find two other experts that are in their near proximity. Instruct students to raise their arms with the number of fingers raised that represents the number of their reading- this is how students will identify others in their expert group. 4. If you do not have enough time for a larger group discussion about the issues, assign questions for students to answer in an online discussion board or through an assigned reflective journal due online before the next class. Once you have read student responses, you can summarize the main points in the next class. Purpose: The Spider Web is a type of word map or concept map. 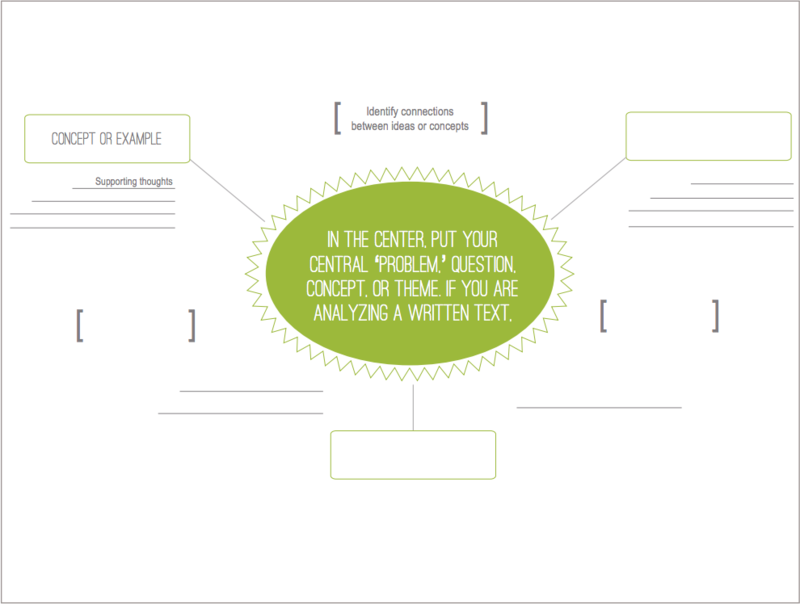 Broadly speaking, concept maps encourage analytical thinking by asking students to identify relationships between conceptual categories. The Spider Web introduces a framework to this mapping, narrowing the areas and introducing conceptual grouping. Write the main topic in the centre. Write the subtopics around the main topic. Write the supporting points around their subtopics. 2. HOW TO USE A SPIDER WEB: A spider web concept map is a great tool for allowing students to organize information from readings in a meaningful structure. It helps them make connections between concepts in the text and identify key ideas. 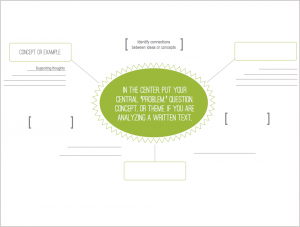 There is no single right way to create a concept map – different people or groups may visualize the text differently, which can lead to great in-class discussion. 1. INDIVIDUAL READING (~5 MIN) Read the text provided as far as you can in the time allotted. Don’t worry if you don’t finish it; you can complete the activity based on the section you have read. 2. PAIRED MAPPING (~10 MIN) With a partner, fill out the spider map using the handout provided. 3. SMALL GROUP DISCUSSION (~5-10 MIN) Combine with the other pairs at your table. Compare the spider maps you all came up with, and work together to draw a consensus version on flip-chart paper. 4. LARGE GROUP DISCUSSION (~5 MINS) Continue your discussion in the larger group. 1. Dividing students up into groups has the potential to take a long time. Give clear instructions about the division as you don’t want them to move too much and so making a suggestion that they turn and pair with someone sitting in front or beside is a quick way to do this. Once they have their pair, distribute the readings. 2. When you are changing over to the small groups (i.e. 2 pairs), instruct students to turn to someone at their table or in the near vicinity. Purpose: Students have the opportunity to learn to identify and assess their own view and understanding. They also become aware of and appreciate other perspectives. This is also a good strategy for a facilitator to use to open a discussion about a particular subject. 1. Draw a line on the floor with a piece of masking tape. 2. Present an issue or topic to the group and ask each member to determine how they feel about the issue (could use a 1-10 scale; 1 being strong agreement, 10 being strong disagreement). 3. Form a rank-ordered line and number the participants from 1 up (from strong agreement to strong disagreement, for example). 4. Form your groups of four by pulling one person from each end of the value line and two people from the middle of the group (for example, if you had 20 people, one group might consist of persons 1, 10, 11, 20). Adapting ‘LINE OF AGREEMENT (‘VALUE LINE’)’: Because this activity, in its original form, requires a lot of movement, as the scale of the class gets larger, it would be necessary to adapt this activity. You could do this by inviting student to raise their hands based on the different value statements. As the facilitator, take note of the approximate number of students who identify with the different value statements. At the end of the activity, recap what you saw from your vantage point and then invite comments from the different levels of agreement. Purpose: It can sometimes be difficult to gauge the different areas that students need clarification on. This activity provides you with an opportunity as an instructor or TA to determine different areas of the course content that are causing ‘blockages’ for students. Once the blockages have been determined, you can address them with the class. 1. Create a list of 10-15 questions based on major themes/ideas of course content. 2. Integrate the open-ended questions into a simple PowerPoint Presentation and set the slides to transition at a 20 (to 30) second interval. 3. Instruct students to get into pairs and to discuss the correct answer for each question as it emerges. 4. While the slides are progressing, circulate through the classroom and listen to the discussion that the students are having about each question. Make a note of places where they are having difficulty, where there are blockages. 5. Back in the larger group, ask students to share the ‘answers’ and to indicate areas where they feel that they need clarification. 6. Address the areas that they need clarification from what they have shared and/ or from what you heard while you were circulating. 7. Follow up with a list of the questions and the answers generated through the activity, as well as areas for further support and send the materials to students as an email or post them online. Purpose: To provide students with an opportunity to think critically about the course material, to draw out students’ misconceptions about an issue related to course content. Procedure: 1. Ask students open-ended questions about the subject to determine their pre-existing knowledge about the subject and to draw out their misconceptions. 2. Once you have generated a list of the misconceptions, divide students into small groups and give the students some questions to help guide their discussion. Invite students to think ‘outside of the box’ and come up with another solution. 3. Invite groups to share their alternative solutions, their ‘a-ha’ moments that have emerged through their discussion. 4. Clarify with the larger group the new method for understanding the problem or issue that has arisen through student observation and discussion. Adapting ‘ELICIT-CONFRONT-RESOLVE’: This is an activity that would adapt well to any size of classroom. As you increase the scale of any activity, make sure you allow for additional time. Clarifying with students after the class with a summary of the discussion and the new way of looking at the issue/problem. These can be posted online or sent by email. It will help to make sure that students are on the “same page”. Purpose: The purpose of this discussion format is to give each person in the group an opportunity to have their ideas, understandings, and perspective enhanced by hearing from others. With this format, the group can explore an article, clarify their thinking, and have their assumptions and beliefs questioned in order to gain a deeper understanding of the issues. 1. Form small groups (3-people), and identify a facilitator/time-keeper for each group (who also participates). 2. Each participant to select one “most” significant idea (and excerpt) from the article. does it relate to your teaching/research? what do you now wonder? to expand on the presenter’s thinking about the quote and the issues raised for him or her by the quote. now what is s/he thinking? what is his or her reaction to what s/he has heard? 6. The cycle continues for each of the other group members, beginning again by sharing a significant idea from the text. Proceed around the group responding to this next presenter’s quote in the same way as the first presenter’s. 7. For each round, allow about 6 minutes (groups of 3 participants: presenter 3 minutes, response 1 minute for 2 people, final word for presenter 1 minute). The role of the facilitator is to keep the process moving, keep it clear and directed to the article, and keep time so everyone gets an opportunity for a round. Adapting ‘THE FINAL WORD’: This activity would work well in any size classroom. However, with a larger group, you would need to change the way that you introduce the activity (i.e., simplify instructions, and make sure that they are both on the screen as well as on a handout so that people can refer to it). You would also need to change the way that you facilitate the sharing—simplifying the process. Barkley, E.F. (2009). –Student engagement techniques: A handbook for college faculty. San Francisco, CA: JosseyBass. Barkley, E., Cross, P.K., & Major, C.H. (2005). Collaborative learning techniques: A handbook for college faculty. San Francisco: Jossey-Bass. The above book was translated to French in 2006 by Martine Leclerc: Bennett, B. & Rolheiser, C. (2006). L’Art D’Enseigner: Pour une intégration créative des concepts d’apprentissage. Montreal: Cheneliere Education. Cherney, Isabelle D. (2008). The effects of active learning on students’ memories for course content. Active Learning in Higher Education, 9(2), 152-171. Diochon, Monica C. and Cameron, Ann Frances. (2001). Technology-based interactive learning: Designing an international student research project. Active Learning in Higher Education, 2(2), 114-127. Gosser, D.K., Trizak, V.S. and Cracolice, M.S. (2005). Peer-Led Team Learning: General Chemistry (2nd ed.). New York: Prentice Hall. Huston, Therese. (2009). Teaching What You Don’t Know. Cambridge: Harvard University Press. Irvine, Judith, Douglas R. Buehl and Barbara J. Radcliffe. (2006). Strategies to Enhance Literacy and Learning in Middle School Content Area Classrooms. Boston: Allyn and Bacon. Johnson, D., Johnson, R.T., Smith, K. (2006). Active Learning: Cooperation in the College Classroom (8th ed.). Edina, MN: Interaction Book Co.
McKeachie, W.J. et al. (2010). Teaching tips: Strategies, research and theory for college and university teachers (13th ed.). Boston: Houghton-Mifflin. Mills, B.J. (Ed). (2010). Cooperative learning in higher education: Across the disciplines, across the academy. Sterling: Stylus. Nilson, L.B. (2010). Teaching at its best: A research-based resource for college instructors (3rd ed.). Bolton, MA: Anker Publishing Company, Inc. Prince, Michael. (2004). “Does Active Learning Work? A Review of the Research,” Journal of Engineering Education, 93(3), 223-231. Short, K. G., Harste, J., & Burke, C. (1996). Creating classrooms for authors and inquirers (2nd ed.). Portsmouth, NH: Heinemann. Thaman, Richa Ghay. (2013). Promoting active learning in respiratory physiology – positive student perception and improved outcomes. National Journal of Physiology, Pharmacy and Pharmacology, 3(1), 27-34.